Predict what will happen next in a story you create. An adorable raccoon, cute costumes, and underwear. What’s not to love? 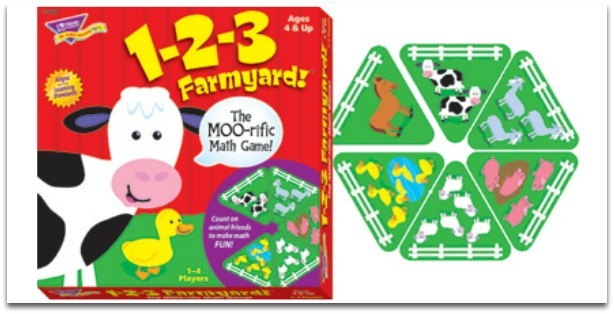 Players race to build a completed farm from animal cards they draw from the deck. Be careful—you can’t use the same animal twice! Perfect for your bug loving preschoolers! Players match insect halves together to form whole bugs, learning more about bugs as they play. The 140 colorful cards can be used to create transportation systems. By matching like pieces (rail, river, roads) players create unique maps every time they play. This one also features solo play! A unique twist on the classic game of memory, your little one will be matching cards with pictures of children from around the world. The faces on the box show which country each child is from, adding another level of social studies to this game if you decide to find each country on a map. From the world of Richard Scarry, this game encourages active play. To set-up, arrange the destination mats around your room (or make the kids run all over the house—I love games that wear them out!) Players take turns drawing passengers, and flying them to the destination with the included airplane. Children in this age band are growing in their academic skills, and playing games will encourage them to practice everything they’re learning. This game grows along with your child. One side of the board features pictures and pre-printed words for letter matching, and the other side is blank—letting everyone create their own words. It’s Bingo, but much more fun! 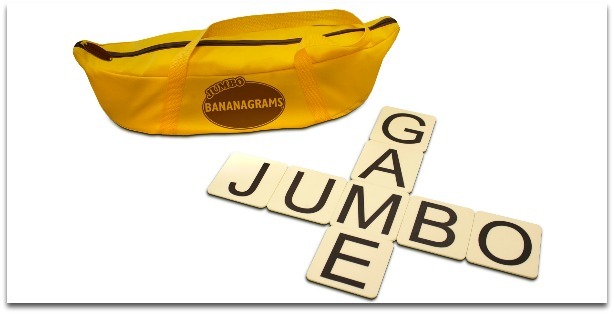 Players slide the Zinger (tile dispenser) to reveal the word to cover. Then they race to find it on their card and cover it. Two levels of play have easier and harder words on the tiles. The Spot It games are amazing! I always have one in my purse or the diaper bag for play on the go. It’s a quick game, and perfect for waiting rooms. Though there are several varieties available, each version plays the same. Players look for the one item that is identical between any two cards. The Basic English version cards feature basic images and sight words. There are many versions available, but I’ve only played the original so far. If you have a recommendation for the others, I’d love to hear it! Players match color or number, trying to be the first to get rid of all their cards. Your child will practice basic money skills in this game as they save, spend, and try not to lose their money. The winner is the first to get a row of five chips on the board. Players use one of their cards, complete the given math problem, and find the answer on the board. Once they’ve spotted the answer, they cover the space with a chip. You have to erupt a volcano to win this game! Play consists of matching science topics to a category (tornado would go under the “weather” category), and playing a memory style game. 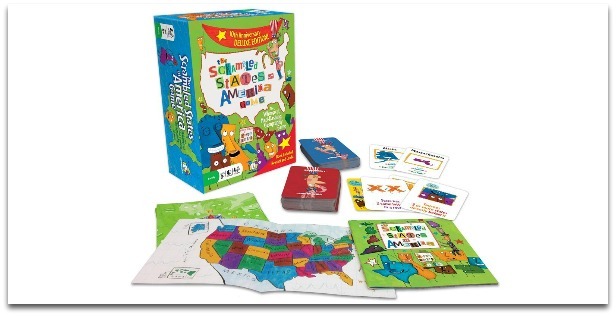 Gently introduce your child to the fifty states of America with this game. Cards require players to search the board looking for state names, pictures, and state shapes. Players answer questions about the manufactured world, the natural world, and world flags as they move around the board trying to get back to start. Reading is required in this game, so purchase according to your child’s abilities. By this age, students are likely reading fluently, and adding and subtracting larger numbers with ease. These games require a bit more thought, as they apply their knowledge in new ways. 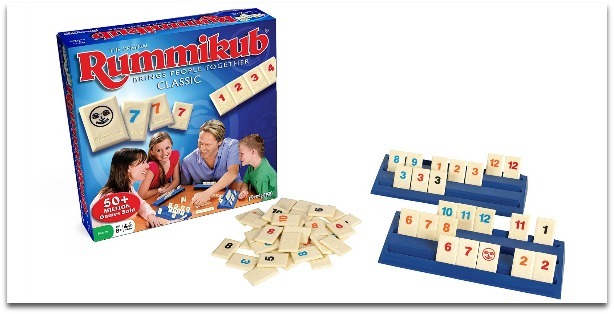 This makes a great game for family gatherings. The cards in this game each feature a noun. Players take turns adding a card in their hand to a card on the table, while explaining how the noun they are covering can fit in the noun they are laying down. Creative thinking is required to claim a set of four cards. Prior to each round, the reader announces what the buzzword is. This word will be used in all 10 answers that round. If the buzzword is wind, clues might be: Your vehicle’s wipers keep it clear (windshield), Rhett Butler and Scarlett O’Hara (Gone with the Wind.) The reader’s team has 45 seconds to make it through all 10 clues. In this storytelling game, players use the events, characters, places, items, and aspects listed on their cards to weave together a story. Other players can interrupt the storyteller, playing a card from their own hand that fits into the story, and then becoming the new storyteller. The goal is to make the story end in a way that matches your ending card. Win Racko by being the first to arrange 10 cards in your rack from smallest to biggest. The numbers don’t have to be in numerical order (1,2,3), though you get bonus points for having runs. A dice game, players try to roll dice to match a requirement given on a card (numbers 1-6, three odd numbers, etc.). 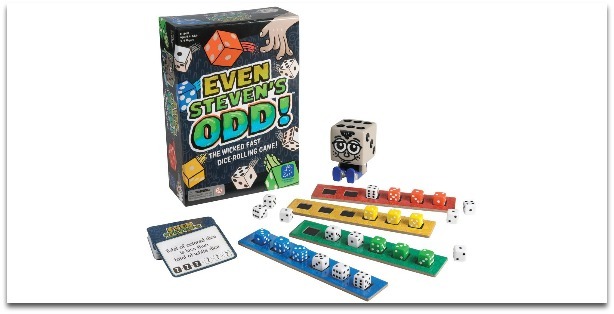 The winner of each round is the first to get all their needed rolls, and grab the Steven figurine. 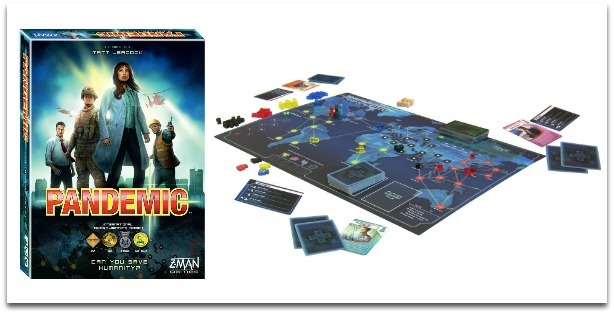 I taught a local board game enrichment class, and we used this one during science week. The stickers are fun (but easy to lose!) Players can try out five different games with the included pieces. Featuring reusable peel and cling stickers, this game will help your child gain basic anatomy knowledge. Players learn about states of matter as they answer scientific questions. A secret decoder adds to the fun. Can you give the scientific name for farting? Could you burp some of the alphabet? If you get your question (or action) right, you can move your organ piece around the body shaped game board. Warning: There are quite a few questions about body waste—that my boys love! I played this one as a kid, and now enjoy playing it with my kids. Start the game creating a secret formula to success by determining how much fortune, fame, and happiness you’ll earn to declare yourself the winner. Once everyone’s formula is created, take turns going around the board and exploring career paths. Some events bring fame, fortune, or happiness, and others take it away. 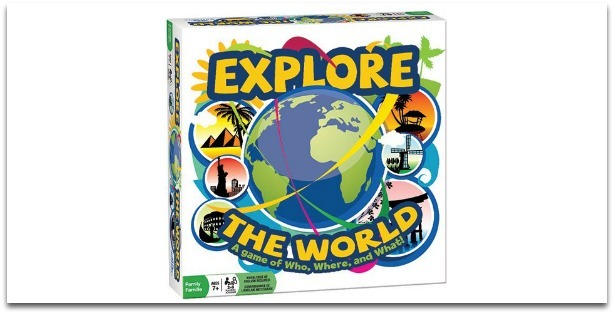 Players will pick up US geography facts as they play this game based on the popular book of the same name. The goal is to send your pile of states home by solving puzzles, riddles, and being observant. We like to read the book before we play—it’s cute! What makes the hazard buildings hazardous? Why are the bonus buildings improvements for property? Middle schoolers usually have the skills needed for most board games. Playing games together will encourage communication, and foster family time. I love drawing games! Art and words combine in this hilarious game similar to telephone. Players begin by drawing a picture that matches their caption card. They pass their card to another player, who then has to write their own caption for the image. Play continues, alternating images and captions. At the end of the round, players try to guess which picture went with each original caption card. 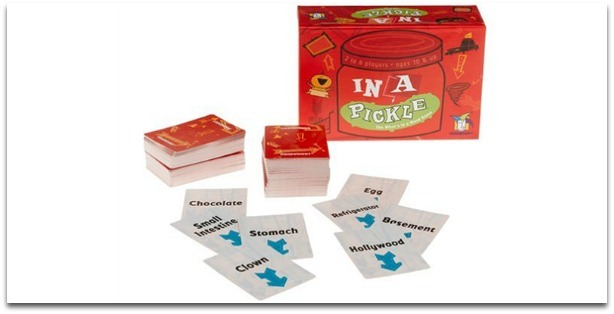 Your family will be stretching the limits of their vocabulary in this game. The goal is to get your team to say the key word. Except, you can’t say certain words because they are taboo! Place your ships along a coordinate plane, and take turns guessing coordinates as you try to sink your opponent’s fleet. Beginning graphing has never been so much fun! 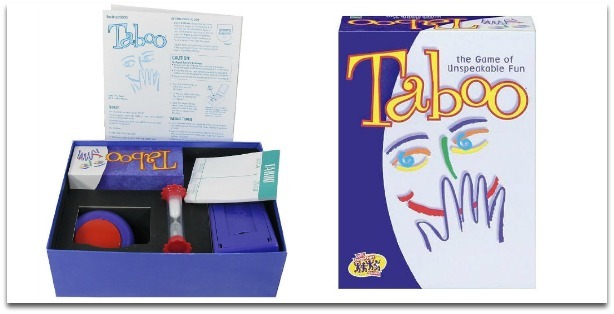 A fun classic that reinforces math skills. Roll the dice and score big by getting certain combinations. Each turn allows three rolls, so probability plays an important role. A single player game, your child’s goal is to collect crystals with their Avatar. They need to play action tokens in a specific sequence to beat each of the 60 levels. Enjoy the great outdoors anywhere as you move your pieces around the board and answer questions. Each card has four versions of a similar question, ranging in difficulty to make the game accessible to both outdoor newbies and enthusiasts. A game for mechanically minded individuals, players will solve problems, build simple machines, and conduct scientific experiments. Warning: Once built, the scale does not fit in the original box. We solved this problem by using a large plastic shoebox and a large Ziploc (for the board and cards), and then discarding the box—I’m sure you’ll be able to think of your own creative solution! A series with multiple titles available, this is the one I currently have, and my 13-year-old daughter LOVES it! The goal is simple. To arrange country cards and transportation cards for a ten day trip across Europe. To keep it interesting, you can only go from one country to the next if they are touching. You have to match color for the transportation cards (a blue plane can take you to a blue country). Thankfully, the board is a map of the continent! Set on Easter Island, players in this game create their own Moai (giant statues) and transport them to different places. Use your resources wisely to earn the most points. Many games at this level require careful critical thinking and strategy. Others are just fun. The reader draws a card and reads a word, spelling it out. Players each write a definition for that word (making it up) while the reader writes the real definition. The reader then reads all definitions aloud, and everyone tries to guess what the real definition is. You get points for getting the correct answer, and for people guessing the definition you designed. A great game for a large group, Apples to Apples requires players to match word cards to an attribute. Communication skills are essential, because you might need to defend your choice. What headline can you make from your random assortment of nouns, adjectives, and verbs? This game is flat out hilarious at times, and I love it from a blogging perspective, since it’s about crafting headlines. Alright, the math certainly isn’t high school level, but it’s a game easily enjoyed by all ages! Arrange your tiles into runs, or collect sequences. Get rid of your tiles to win. Players develop their budgets and then get $2000. Expenses arise, investment opportunities open, and insurance needs paid for. Money management skills are crucial to win this game—you get a bonus if your budget is close to what actually happened. It’s like Scrabble. With numbers. Add, subtract, divide, and multiply equations and add up the points. It’s a quantum physics game. Seriously! Put together particles and be the first to form a hydrogen atom. For more advanced game play, you can try other atoms! Are you up to saving the world? I hope so. Diseases are on the rampage, and outbreaks are coming. Humanity needs scientists to work together to stop the spread and find a cure. A game for those with an entrepreneurial spirit, Pitch It gives each player something to sell, and a target audience. The goal is to create the perfect slogan, logo, and product name to complete the sale. After the design stage, players share their pitches, and everyone votes on the winner. We’ll call this one Current World Affairs, okay? Players use their knowledge of company logos to win. Answer a question correctly, and move on the board. As you can see, board games are awesome. There’s something for everyone! Give the gift of a game, and encourage your family to play together. Learning will happen gently and naturally as you play. 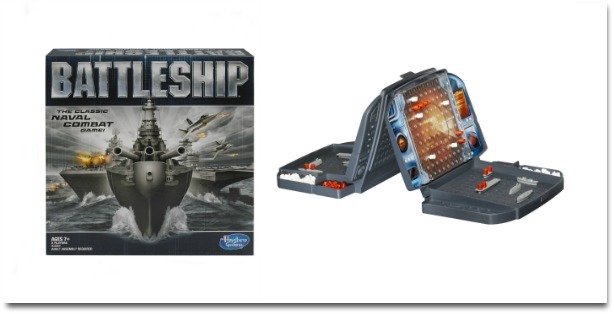 Which of these games do you think your family would enjoy? Do you have any additional recommendations to share with us? Lisa Tanner is a freelance writer with a background in education. She earned a Master’s Degree in Elementary Reading & Literacy and taught in the public schools of Washington prior to becoming a full-time homeschooling mom and writer. Lisa lives on a farm with her husband, their seven children, and many animals. You can learn more about her at www.maggiesmilk.com. Wonderful list. Really liked the way you’ve explained each of them. Tell me a Story is my little one’s favorite and she enjoys learning from it. The best part is that I ‘m going to keep referring to this post as she grows! Thanks for the post Lisa and thank you Sumitha for having Lisa share it with us. Thank you Patricia, I’m glad that you found it useful. Tell Me a Story has such cute cards, what a fun game to play with your little one! This is a great list! I’m a pretty enthusiastic gamer as an adult and I haven’t heard of a number of these. I’m a big fan of the Tell Me a Story cards, Apples to Apples, Settlers, and Pandemic. I actually played the Farming Game at someone’s house whose parents were farmers and found it hilariously, realistically depressing. She described it like Monopoly, but absurdly hard for anyone to win. A couple that I really like that aren’t on here are Dixit (create short descriptions for beautifully illustrated cards – great for language arts), Ticket to Ride (strategic thinking, railroads, geography), and Takaido (strategic thinking, Japanese culture). I’m so glad you enjoyed my list–games are so much fun! We had to create a few house rules for the Farming Game, because otherwise it does do exactly what you mentioned–it goes on forever! I haven’t played Dixit yet, and have never heard of Takaido, so thank you for sharing your suggestions! Thank you for the great list of board games, Lisa! I would recommend also to look at Koikiwi website http://www.koikiwi.com/. It’s set of educational environmental games where kids are learning about ecological issues while playing games. Online Learning Games for kids are a great way to build the skills that kids need to succeed in school. 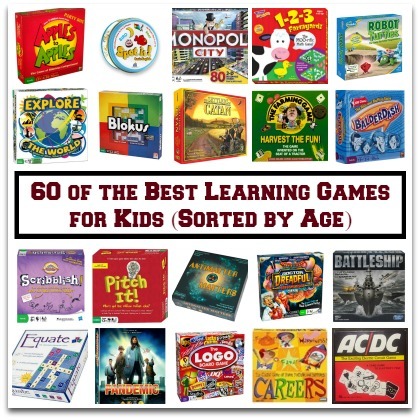 These educational games for kids make learning fun with math facts, language arts, and more. Children enjoy learning with educational games. Have you heard of the Xtronaut games – The Solar System Exploration and the Constellations? I think they are great, too. This sounds like a fantastic resource prepared by the most qualified person imaginable. However, I instantly hit a big stumble that may send many readers away. My kid is 8-years-old and plays Roblox. His granny provided money for a computer game he is to get for Easter. In other words, no time for research. For a dad with 3 minutes to spare, I really miss the content list to quickly jump to 8-year-olds. Secondly, Roblox or Minecraft are not mentioned. To my ignorant mind they are supposed to be the best. If you disagree, you could mention them with a line of explanation why you do not like them.